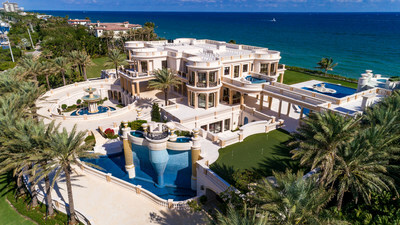 NEW YORK, Nov. 13, 2018 /PRNewswire/ -- Concierge Auctions has announced that bidding is now open for the auction of Playa Vista Isle, one of the most expensive real estate listings in the entire country, located on one of the highest points of Florida's "Millionaire's Mile." Bidding began Monday, November 12th on ConciergeAuctions.com, and the sale will conclude at a live auction at 5 p.m. EDT on Thursday, November 15th. "The level of exposure is the most that Concierge Auctions has experienced for a property to date," stated Concierge president Laura Brady. "Five bidders have already registered, and additional registrations are underway." Ideally situated on 5± acres in Hillsboro Beach, Playa Vista Isle is the only Ocean-to-Intracoastal Waterway estate on the entire Gold Coast to offer both 500± feet of private oceanfront beach as well as two concrete deep-water yacht docks. The estate was completed in 2018, has never been occupied, and features 30,000± square feet of living area, 11 bedrooms, 22 bathrooms, and 22-karat gold leaf gilding throughout. Additional amenities include the world's first private 3D-IMAX© in-home theater; 20-car garage with secure tunnel access; 3,000± bottle wine cellar secured by biometric access with adjacent tasting room; 4,500-square-foot heated infinity edge pool; oversize Jacuzzi perched 40± feet above the ocean featuring unobstructed panoramic views of the horizon; 13 water features including six waterfalls; and a putting green. The property also includes an adjacent lot that can accommodate an additional structure, garden area, or recreational facility. With its world-class finishes, Playa Vista Isle has been awarded the "World's Best Property," "Best Residential Property-Florida," and "Best Architecture Single Residence-Florida" by the International Property Awards. Concierge Auctions offers a commission to the buyers' representing real estate agents. See Auction Terms and Conditions for full details. For more information on the auction or to register, visit ConciergeAuctions.com or call (212) 202-2940. Concierge Auctions is the largest luxury real estate marketplace in the world, powered by state-of-the-art technology. Since its inception in 2008, the firm has generated billions of dollars in sales, broken world records for the highest priced homes ever achieved at auction, and is active in 38 U.S. states/territories and 20 countries. Concierge curates the most prestigious properties globally, matches them with qualified buyers, and facilitates transparent, market-driven transactions in an expedited timeframe. The firm owns arguably the most comprehensive and intelligent database of high-net-worth real estate buyers and sellers in the world. It has been named one of America's fastest-growing companies by Inc. Magazine for the past five years, and has contributed over 100 homes to-date as part of its Key for Key® giving program in partnership with Giveback Homes, which guarantees that for every property the company sells, a new home will be built for a family in need. For more information visit ConciergeAuctions.com.